A judge Wednesday ordered Maine’s Secretary of State to move forward with implementing ranked-choice voting for the June primaries despite concerns about conflicting language in state law. Later in the day, the same judge also heard arguments in a separate Maine Senate challenge that could end with the state’s Supreme Judicial Court making the final decision about whether Maine will be the first state in the nation to use ranked-choice voting statewide this June. In a 14-page opinion released Wednesday morning, Kennebec County Superior Court Judge Michaela Murphy ordered Secretary of State Matthew Dunlap to continue preparing to use ranked-choice voting for gubernatorial, congressional and legislative primaries on June 12. Murphy agreed with the Committee for Ranked Choice Voting – the group that led the successful November 2016 ballot campaign – that uncertainty over the election process could cause “irreparable harm” at this stage. The legal twists and turns are largely the result of a near-evenly divided Legislature – where Republicans hold a one-seat majority in the Senate and Democrats a five-seat majority in the House – being unable to reach agreement over how, or even if, the ranked-choice voting law passed by voters in 2016 should move forward. Democrats generally support moving forward with the new voting system, while Republicans do not. Ironically, one of the primary arguments by supporters of ranked-choice voting, is that it would reduce the sharp partisan divide, often blamed for dysfunction in state government. The ranked-choice system would be a factor only in one three-way legislative primary contest this June – the vast majority are two-way races. But it could have a major impact on which of the seven Democrats and four Republicans win their party’s nomination for governor this year. In a traditional election, whoever gets the most votes wins, whether it is a majority or a plurality, which can be less than 50 percent when there are more than two candidates. Under the ranked-choice system, voters select candidates in order of preference. If no candidate receives more than 50 percent of the vote, the candidate with the fewest first-choice votes is eliminated. Voters who preferred the eliminated candidate would then have their ballots added to the totals of their second-ranked candidates, and the ballots would be retabulated. The process continues until one candidate has a clear majority of votes. Time is short for the courts to resolve the disputes. The state still needs time to print ballots and some local election officials need time to add tabulation machines, or reprogram existing ones to count ranked-choice ballots. During a brief court hearing Wednesday afternoon on the newest challenge, Murphy directed attorneys for the Senate and Maine Secretary of State Matthew Dunlap to reach agreement on the key questions they want answered if the decisions is left up to the state’s high court. But Murphy also cautioned that the high court could refuse to take up the matter if it determines the Senate, as only a portion of the legislative branch, lacks standing before the court. Murphy also directed an attorney for the Committee on Ranked Choice Voting to prepare his arguments as to why the committee should also be allowed to weigh in on the matter. Murphy told the parties involved she hoped they would have all of their responses ready to go by Monday, which would still provide enough time for the high court to take the matter up and rule on it, if it so chooses. In the Maine Senate complaint filed Wednesday, attorney Timothy Woodcock listed a host of constitutional concerns while asking the court to halt ranked-choice voting. Specifically, the Republican-controlled Maine Senate contends the Legislature never provided Dunlap’s office with the funding or the rule-making authority necessary to implement ranked-choice voting. Additionally, the complaint argues, Maine law only allows state police to retrieve physical ballots or electronic copies of those ballots in the event of an official recount of an election, not for ranked-choice voting. As a result, the Maine Senate is asking Murphy to find that Dunlap is exceeding his constitutional authority in proceeding with implementation of ranked-choice voting. Following the hearing, Woodcock said it remained in dispute whether or not Dunlap had the funds to conduct a ranked-choice election in June. “The Legislature has never appropriated any money for the implementation of ranked choice voting. That just never happened,” he said. James Monteleone, an attorney for the Committee for Ranked Choice Voting, said the Legislature had appropriated funds and authorized Dunlap to conduct primary elections, despite the fact it was not specific in how those elections would be conducted. “(That argument) distracts from the key focus that funding was appropriated to conduct an election,” Monteleone said. He also said the committee wants to intervene in the new complaint and challenge whether the Senate has standing before the court given that it represents just one of the two houses of the Legislature. “Case law would suggest the Senate wouldn’t have standing on any of these matters,” Monteleone said. Despite Murphy’s ruling ordering Dunlap to continue implementing the voting system, it was clear the final decision on ranked-choice voting for June would take several more days, if not weeks, to be settled. Phylis Gardiner, an attorney for Dunlap’s office, said the decision should be finalized by April 13 in order to give enough time to print ballots for the election and distribute them, especially to Maine voters serving in the military overseas and others residents voting from away. Last week, Dunlap cast doubt on Maine’s plans by pointing to the discovery of conflicting language in the existing law dealing with whether candidates are elected by a plurality or majority of votes. While Dunlap said his office would continue working to implement ranked-choice voting, the Committee for Ranked Choice Voting quickly filed a complaint seeking a court order requiring Dunlap to work toward a ranked-choice primary on June 12. The legal machinations are the latest confusing developments over a ballot initiative that was approved by 52 percent of voters in November 2016. Last year, the Legislature voted to delay implementation and potentially repeal the law after Maine’s high court raised constitutional questions about the initiative. In response, the Committee for Ranked Choice Voting collected enough petition signatures for a “people’s veto” of the bill passed by the Legislature last year that delayed and potentially repealed the switch to a new system. As a result, Maine voters could simultaneously use the ranked-choice system to decide the primary winners of gubernatorial, congressional and legislative primaries this June even as they vote on whether to continue using the process in future elections. 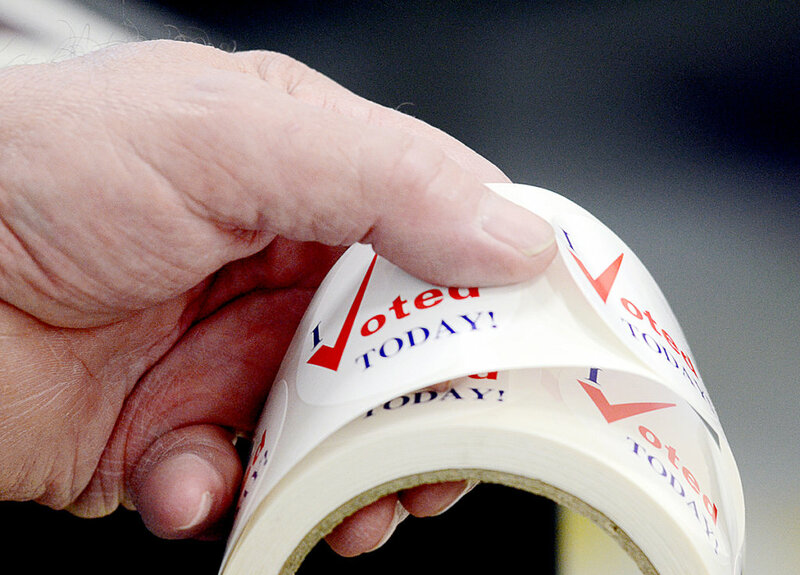 Jockeying over ranked-choice voting has fallen largely along party lines at the State House. House Speaker Sara Gideon, D-Freeport, praised Murphy’s ruling ordering Dunlap to proceed with implementation. Senate Minority Leader Troy Jackson, D-Allagash, also said Democrats would attempt to introduce a joint order from both the Senate and the House that could trigger a new bill to address the specific concerns being raised. That bill directs the Legislature’s Veterans and Legal Affairs Committee to craft a bill that provides funding to Dunlap, authorizes him to take physical control of ballots and authorizes state police to retrieve ballots for the tabulation of ranked-choice voting results. Jackson said Democrats already believe Dunlap has the authority, but the proposed legislation will resolve any doubts among Republican lawmakers. “Here is a bill that the committee will deal with – Republicans and Democrats – and we will come to an actual compromise and work on it together to make sure … everybody knows he does have the jurisdiction, and where we are going to get the money from,” Jackson said. But Republican leaders in the Senate on Wednesday seemed uninterested in any new legislative fix and were urging Murphy to kick their questions up to the state’s Supreme Judicial Court for consideration. Senate President Mike Thibodeau, R-Winterport, confirmed Senate Republicans had not reached out to House Democrats to identify a legislative fix. But Thibodeau rejected arguments that the Legislature has failed to address the concerns over ranked-choice voting or is actively stymieing its implementation. “The Legislature came together and passed a bipartisan bill that would have suspended the implementation and given the advocates for ranked-choice voting the opportunity to go and make their case and change Maine’s Constitution,” Thibodeau said. However, a constitutional fix is unlikely in the current political climate because it would require two-thirds majority votes in both the House and Senate as well as approval by a majority of Maine voters.